Home » Could a ‘Death Star’ Really Destroy a Planet? Countless Sci-Fi fans vividly remember the famous scene in Star Wars in which the Death Star obliterates the planet Alderaan. Could a small moon-sized battle station generate enough energy to destroy an Earth-sized planet? A paper by David Boulderston (University of Leicester) sets out to answer that very question. First, for the uninitiated, just what the heck is a Death Star? According to Star Wars lore, the DS-1 Orbital Battle Station, or Death Star, is a moon-sized battle station designed to spread fear throughout the galaxy. The image above shows the Death Star as it appeared in Star Wars Episode IV: A New Hope (1977). The Death Star’s main weapon is depicted as a superlaser capable of destroying planets with a single blast. 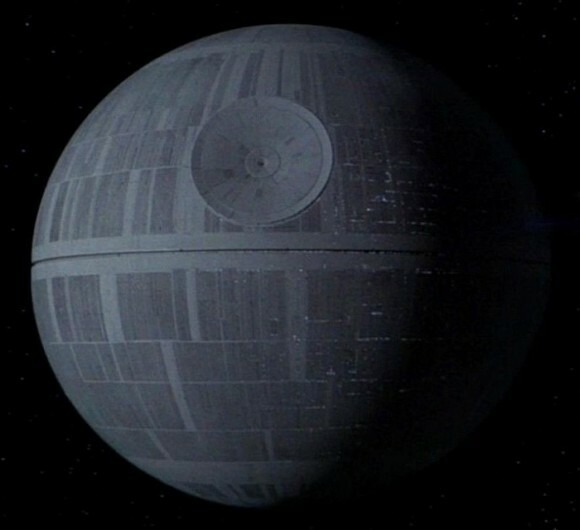 Boulderston claims that it is possible to estimate how much energy the Death Star would need in order to destroy a planet with its superlaser. There are a number of assumptions made, however, in order to come up with the energy requirement. Where G is the Gravitational Constant(6.673×10-11), Mp is planet mass, and Rp is the planet’s radius. Using Earth’s mass and radius, the required energy comes out to 2.25 x 1032 Joules. Using Jupiter’s data, the energy required goes up to 2 x 1036 Joules. Boulderston asserts that (according toStar Wars lore) the Death Star is powered by a ‘hypermatter’ reactor, possessing the energy output of several main-sequence stars. Given that the power output of our Sun is about 3 x 1026 Joules per second, it’s a reasonable assumption the Death Star’s reactor could power the superlaser. Despite using a simplified model of a planet, Boulderstone states the simplified model is reasonable to use since the Death Star’s main power reactor has the energy output equal to several main-sequence stars. Even if Earth’s exact composition were used in the equation above, the required energy to destroy a planet would only be affected by a few orders of magnitude – well within the Death Star’s power budget. Boulderstone reiterated that the energy required to destroy a Jupiter-sized planet would put considerable strain on the Death Star. To destroy a planet like Jupiter, all power from essential systems and life support (no re-routing from the auxiliary EPS conduits – that’s aStar Trek hack!) would be required, which is not necessarily possible. Boulderstone’s conclusion is that the Death Star could indeed destroy Earth-like planets, given its main power source. While the Death Star could destroy an Earth-sized planet, a Jupiter-sized planet would be a tough challenge, and the Galactic Empire would need to resort to using a Suncrusher to destroy stars.